The Inpatient Rehabilitation Center at Wise Health System provides simulated real-life environments where patients perform daily activities, such as navigating the kitchen and getting into and out of a car. These activities help patients re-learn functional skills. Group settings are encouraged to help patients re-engage with others and to create a more enjoyable stay. Weekday, evening and weekend activities range from community dining, cooking sessions, exercise programs and enjoying games with other patients. The 15-bed Inpatient Rehabilitation Center provides a full spectrum of services. Six days a week, patients are typically involved in three or more hours of combined physical, occupational, and/or speech therapy. Family members are also invited to be included in the patient education process, given the patient’s pre-arranged consent. A physician on the hospital’s medical staff develops and leads an interdisciplinary rehabilitation program for each patient. Patients have access to various specialists at Wise Health System as well as advanced technology and hospital services. Each provider caring for patients in the program is dedicated to creating a positive, safe and nurturing environment. Our goal is to achieve the highest level of independence for our patients. Potential to benefit from an intensive rehabilitation program. The Wise Health System assessment coordinator can provide on-site assessments for patients either in the hospital or at their place of residence. Rehabilitation staff follow-up with referring physicians through discharge summaries and clinical updates as appropriate. Our therapy department staff has more than 65 years of combined experience. The team includes three physical therapists, an occupational therapist and a certified occupational therapy assistant. All of our nurses also are specialized in rehabilitation nursing. This specialization means they are trained in the use of adaptive equipment, as well as compensatory techniques to improve self care activities, mobility and cognition. Neuro Developemental Therapy (NDT) was developed for the treatment of individuals with pathophysiology of the central nervous system (CNS). Individuals with CNS pathophysiology have dysfunction in posture and movement and subsequent functional activity limitations. The LSVT Big® Program applies principles that increases movements in the limbs and the body (“bigness”) and improves coordination for individuals with Parkinson’s and other neurological conditions. Wound care certifications mean our therapists and use the most advanced technology and latest treatment techniques to provide the best care for treating and healing wounds. Once patients have completed their rehabilitation stay, they are evaluated for the need of follow-up services. A coordinated plan of care for life after discharge is developed and services are identified to help patients maintain and improve their house. 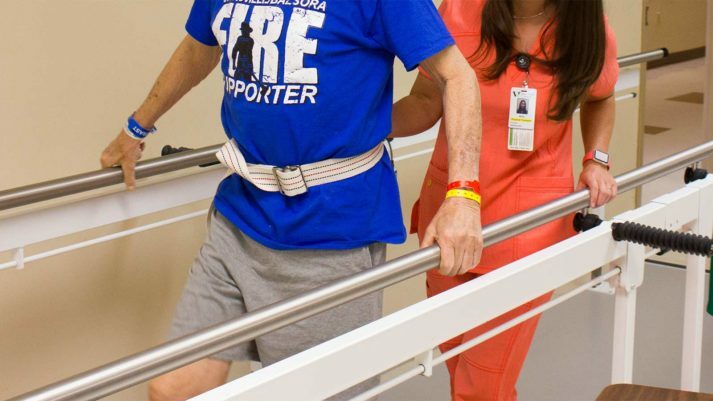 Rehabilitation therapy may be continued on a home health or outpatient basis at the Fit-N-Wise Rehabilitation and Performance Center in Decatur.